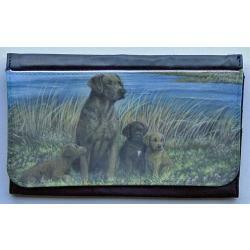 Our Chesapeake Bay Retriever Gifts are created from exclusive dog breed art by Gone Doggin. Gone Doggin Chesapeake Bay Retriever art features the Chessie dog in their natural environment and accurately depicts the dog breed as described by the breed standards. 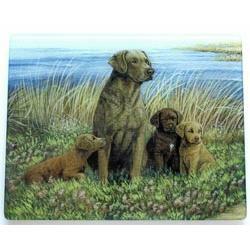 This makes our Chesapeake Bay Retriever gifts and merchandise highly collectible and truly unique dog gifts for dog lovers. The Chesapeake Bay Retriever, the state dog of Maryland, was developed along the shores of the bay for which they are named. Known as the toughest water retriever, they are a true American breed with an excellent temperament. They are an extremely intelligent hard working breed that was first recognized by the American Kennel Club in 1878 and classified in the sporting group.